A recent trip to the Lakes had reminded me of how much of it I still have to visit so it seemed an appropriate destination for a bank holiday weekend trip. Most of the UK population seemed to have the same thought and faced with gridlock on the M6 I almost diverted to N.Wales, but I persevered and eventually arrived in Kentmere at 6pm on Saturday evening. Parking. A simple act, but one which gives disproportionate amount of stress when trying to find somewhere to leave a car for a few nights. Driving into Kentmere there was but a single car park with a clear warning of no overnight parking. Knocking on the door of a nearby cottage I was directed to ‘Christine’ whom I sweet-talked with hard cash to allow me to leave the car for a couple of nights. 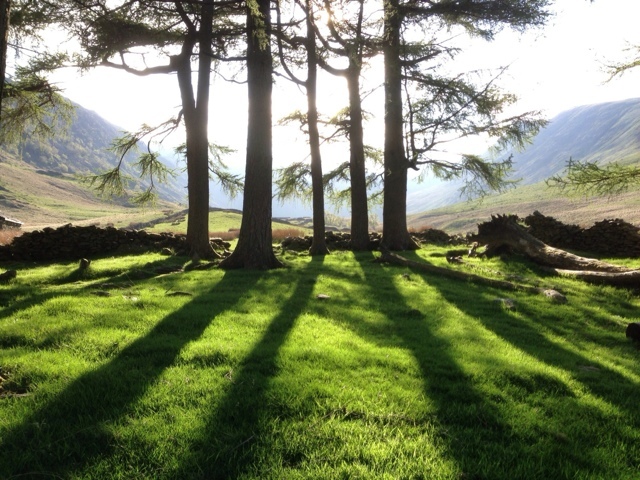 The loose plan was to head up to Harter Fell and explore some of the Eastern Fells for a couple of nights, re-acquainting myself with Haweswater, which is one of my favourite lakes. Packing for two meant taking my North Face Tadpole tent – all 2.4kg heft of it – and it instantly seemed to fill my OMM Villain pack. Replete with my new Sawyer filter I eschewed my usual 2 or 3 litres of water, opting to save weight and fill up as I go. I also decided to bring my Canon SLR along with and a spare lens, together with a small tripod, intending to make more of an effort with my photography. With a full-pack I was resigned to carrying my camera in a separate shoulder holster. Making our way up eastern flank of the valley the streams looked a little low and as we were intending to camp high this evening I decided to stock up on water early. Plodding upwards, my camera bag swinging with each step, a fierce looking ram stood proudly on an outcrop, looking a good candidate for a quick shot in the evening sun. After the satisfying click of the shutter, I dropped the camera from my eye to quickly review the shot and saw the immortal words on the screen “No Memory Card”. Bugger wasn’t quite the word I uttered as I realised I was now going to be lugging a kilo and a half of Canon ballast for the weekend. I tried to console myself by thinking the extra weight be good training for the trip to the Tatras in June. The wind was blowing a little harder than expected and I decided that camping higher would likely be too exposed, so we scouted around the outcrops of Shipmans Knotts, finding a flat spot with views straight down Longsleddale. The days are noticeably longer up north so after dinner we climbed on the crags and watched the sun slowly dip behind the the peaks to the north-west. The night was uneventful and we woke to a beautiful morning. 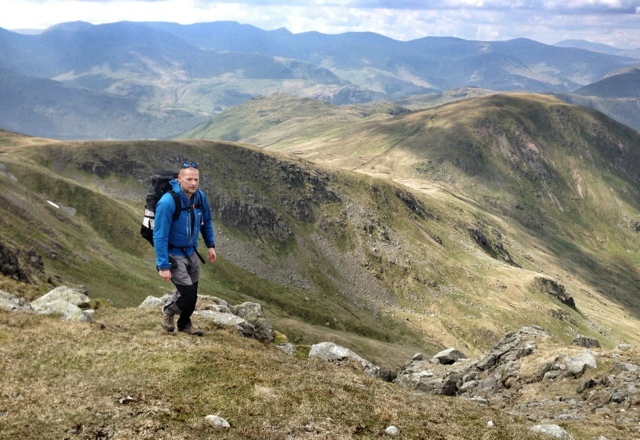 Having eaten through some provisions I at least managed to fit my camera bag into my main pack so was less encumbered by the swinging mass as we headed up Kentmere and on to Harter Fell where the view opened out. It’s a splendid spot looking out over Haweswater, the ridge of High Street to the west and the undulating peaks on the west side of Kentmere valley behind us. It seemed opportune to enjoy a snack and soak up the sun. We turned to find a huge bank of dark low cloud almost upon us, donning wind proofs before heading down to Nam Bield pass. I had already picked out Small Water below as a possible camp spot for that evening. The cloud closed in on us as we headed up Mardale Ill Bell and on to High Street, breaking occasionally to gives wonderful views of sun-kissed summits,with the odd glisten from a far flung tarn. 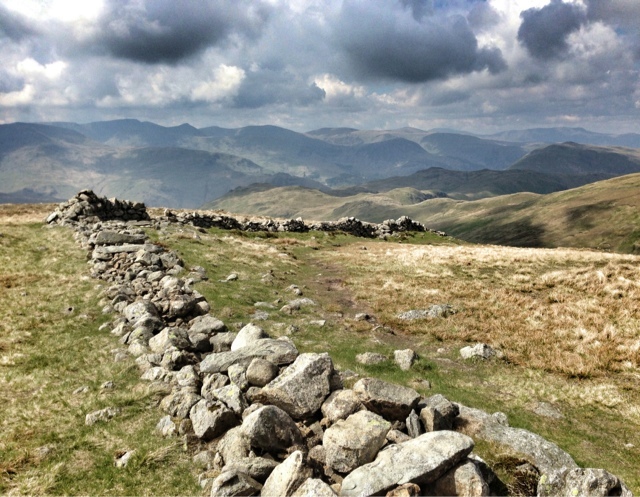 Ambling along High Street and the cloudy lifted to allow uninterrupted views across to Helvellyn to the west. Perched behind a wall we broke out the Jetboil for a cuppa and some lunch. We decided that we’d wonder a bit further north admiring the views before heading down to Haweswater then making our way back up to Small Water to camp. 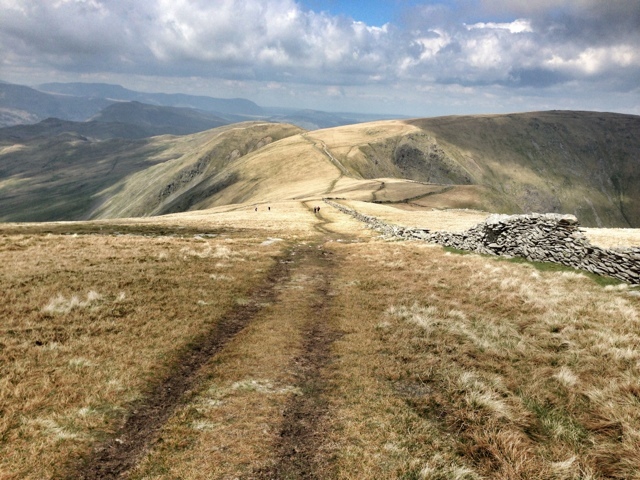 We de-toured to The Knott before heading along to High Raise then back to Kidsty Pike, before heading down the ridge. It was just after 4pm as we approached Haweswater by Bowderthwaite Bridge. It was a beautiful spot and someone already had a tent up by a stream. We decided that we’d stay here for the evening and detoured off the path to explore the shore amongst old ruins and found an ideal camp-spot underneath some pines. 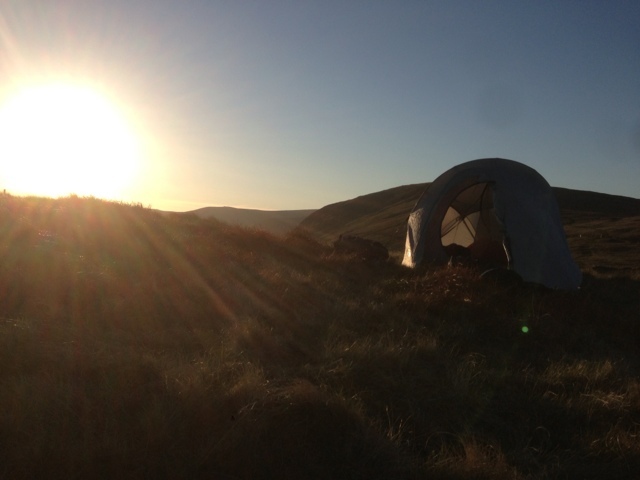 It was early so we relaxed in the sun, bathing feet in the lake and freshening up with a cool wash.
As the sun gradually descended over Kidsty Pike it lent a warm glow over Riggindale but as it set the wind increased. It was pretty blowy during the night, but the Tadpole held firm. The morning was complete contrast from the night before and it soon started to rain as we struck camp. Rounding the southern tip of Haweswater the rain became more incessant as we worked our way up to Small Water. A few metres on and we were in the could, unable to see the pass above us. The path and stream were near indistinguishable as we trudged upwards. The stone shelter eventually appeared as a dark shape in the midst as we finally approached the head of Nam Bield pass. The wind was funnelling through the pass, driving rain into our face so the wall gave some respite and an ideal spot to break out the Jetboil for our remaining cup-a-soup. From here it was all downhill, though the driving rain meant it was rather more of a chore for the 6km or so back to the car. True to form the rain stopped just as we entered Kentmere and the sanctuary of the car and dry clothes. I’d just about dried out as we arrived back in London.